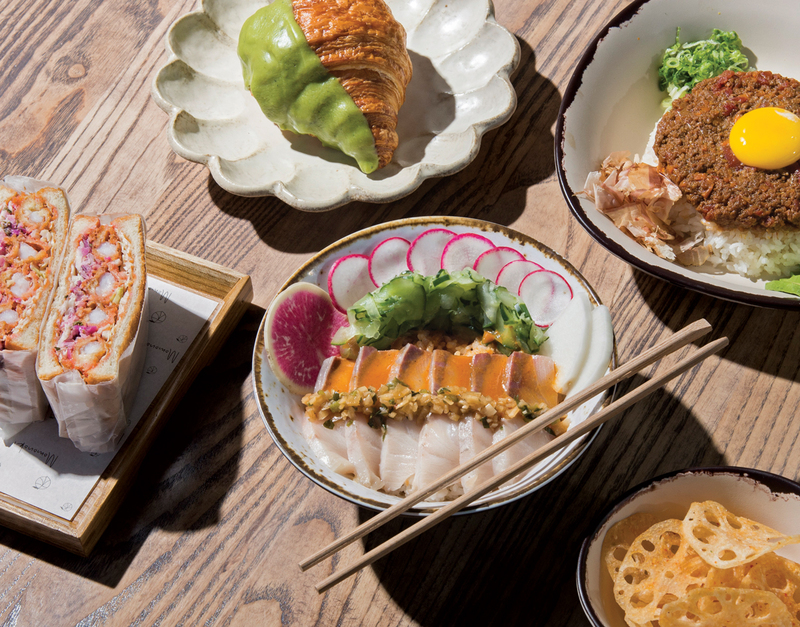 You can learn a lot about the origins of Momonoki, a new fast-casual joint in Midtown, from the Instagrams of Taiwanese-American chef Jason Liang and Taiwanese pastry chef ChingYao Wang (who’s also his wife). The couple best known for Decatur’s Brush Sushi Izakaya recently ate their way through Taipei and Tokyo as inspiration for Momonoki and its attached bakery, Momo Cafe. The deliciously atmospheric images from the trip—homey beef noodle soup in New Taipei City’s Banqiao District, lemon coffee with crushed ice in neighboring Zhonghe District, extra-strong matcha soft serve in Tokyo’s Ginza Six complex—are like a moodboard for their clever new project. Liang and Wang understand chic aesthetics, and every detail at Momonoki (Japanese for “peach tree,” wink-wink) feels built for snaps. It’s difficult to find a more beautiful looking bowl of ramen in Atlanta, but these bowls are not perfect: The broths in the classic ramen preparations can lack refinement, and the Sun Noodles can be overcooked. Those noodles fare much better in the tsukemen (a style of ramen in which you dip the noodles into hot, salty broth). Just as good as the tsukemen is the Nagoya Taiwanese Mazemen, in which thicker noodles are topped with stir-fried pork, a poached egg, Asian chives, and garlic. Cute katsu sandos (cutlet sandwiches) are fun to share; go for the fried shrimp with tartar sauce studded with shibazuke (Japanese pickles). Sidestep the poké for other beguiling bowls, such as sliced yellowtail—plucky with cured cucumber and a bright jalapeño-cilantro salsa—served over chili ponzu rice or over mixed greens. A hearty bowl of dry-curried ground beef over rice with a runny poached egg and sliced avocado is pure comfort food that you can eat with a spoon in one hand while you scroll with the other. Over at the cafe, Wang’s pastry offerings include her popular matcha brownie, black-sesame or matcha soft-serve ice cream, and croissants slicked with black-sesame or matcha icing. The cafe’s drinks also are compelling: black-sugar, matcha, or strawberry lattes, roasted teas from Japan, and oolong teas from Taiwan. They’re lovely to sip as you watch traffic crawl by on the Connector. Momonoki embraces the adjacent gridlock. Its logo is a peach with the kanji character for “wood” written inside, which resembles a crude map of our highway system. Despite Momonoki’s global influences, you can’t get more Atlanta than that.